Hardcover, 80 pages, 17.0 x 24.0 cm, 6.7 x 9.4 in. Moving house is a lot of work, Luna thinks, not to mention all the unpacking. When Carlo suggests that she moves into his tree-house and he takes over her room, she is immediately all for it. They both embark on the task ahead of them with great enthusiasm. But imagine their disappointment when they enter their rooms and see that from now on Luna will be sleeping in a hammock and Carlo in a pink nightmare. And not only that. His favourite blanket – his security blanket – has shrunk in the washing machine to the size of a face cloth … Carlo is close to tears. Will the little Cat-Bear ever be able to forgive Luna? It is pretty obvious that the two of them will soon be friends again. In the meantime, Luna really has to think up something very special. 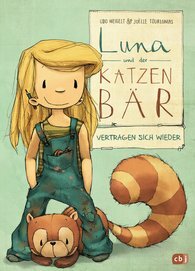 But in the end Luna and the Cat-Bear make up again!